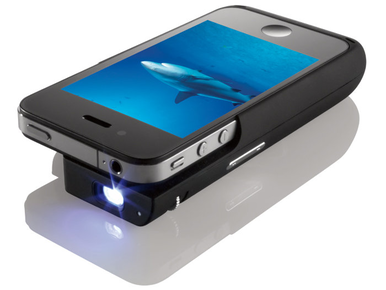 Electronics giant Texas Instruments (TI) and specialty retailer Brookstone have announced the Pocket Projector for iPhone 4, a case for the iPhone 4 and iPhone 4S that incorporates TI's Pico projector technology to offer on-the-go video projection. The $230 Pocket Projector is similar in design to many iPhone battery cases—your phone slides into the case, which hosts a USB-chargeable 2100mAh battery—except that the top of the case doesn't wrap around your iPhone. This means less protection, but it also makes it easy to quickly slip your phone into or out of the bulky case. Near the iPhone's headphone jack at the top of the Pocket Projector is the projector's lens, powered by a 15-lumen-LED projection lamp and TI's DLP Pico projector technology. On the back of the case is a small, 0.5-Watt speaker. The companies claim the projector can produce an image of up to 50 inches (measured diagonally) with a 640- by 360-pixel native display resolution; a small dial lets you adjust the projector's focus. The Pocket Projector works with any app that supports dock-connector video out, including the stock Videos, Photos, and YouTube apps, along with third-party apps that specifically offer this feature. 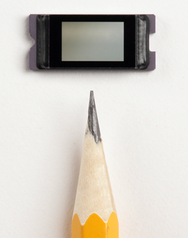 Over the weekend, I spent some hands-on time with the Pocket Projector, and I found it to be easy to use. As with Apple's video-output cables and adapters for the iPhone, once you place your iPhone in the Pocket Projector, so that the latter makes a good connection with the phone's dock-connector port, any app that supports video-out automatically sends video to the projector—you don't have to change settings or otherwise activate the feature. I was able to achieve the claimed 50-inch image from a distance of about eight feet. Once focused, the Pocket Projector's image is pretty clear, although a dark room is required for the best image quality, and small or thin-font text in Keynote presentations can be difficult to read thanks to the projector's low resolution. I found the Pocket Projector to be most effective for watching video and for displaying photo slideshows to a group.The internal speaker doesn't play very loud, but you can use external speakers by connecting a standard 3.5mm audio cable to your iPhone's headphone jack—because of the placement of the projector's lens, you just need to be careful that the cable doesn't block the lens. You can also use the Pocket Projector as a backup battery, much like the aforementioned battery cases. The Pocket Projector is currently available for pre-order on the Brookstone website. The company expects the product to start shipping next week.